Are you wondering why dogs eat their puppies? It’s not something extremely common, but it happens. Having a newborn litter of puppies around you can be an exciting event. These little fur balls are so tiny and adorable! But, sadly not all of them grow into adults. There are many reasons why newborn puppies die, like respiratory problems, mastitis, circulation problems, infections, and other issues. But sometimes, it’s the mother herself who kills her newborn puppies. Let’s talk about this in more detail. Let’s talk about cannibalism for a minute, get ready. Cannibalism is when one animal eats another one that belongs to the same species. Now, cannibalism is very rare when it comes to dogs. It’s even more uncommon in a litter birthed in an enclosed home environment, compared to that of a loud kennel. t’s not specific to any breeds and female dogs of any pure or mixed breeds can eat their own puppies. That being said, it may or may not be something that’s inherited. Also, may or may not happen again from one litter to another. So why do dogs eat their puppies? Let’s talk in detail about why dogs might eat their puppies. It’s a sad thing, but there are quite a few reasons something tragic happens. Sometimes dogs need to have C-section to have puppies, in the same way humans may need a C-section to give birth. Some experts believe dogs who give birth this way are less likely to recognize their little fur balls as their own since the mother’s body doesn’t really release the hormones she should have while giving birth naturally. Well, since she doesn’t recognize the puppies to be her own, their high-pitched noises and erratic movements can annoy her. She may not let them feed at all. The erratic movements can activate her predator instinct, and she ends up killing (and eating) these tiny, helpless babies. But, there’s another side to this cannibalistic story. Sometimes, even after natural birth, the hormones kick in after a lag. But before they kick in, the mother can actually just kill off her entire litter. This is especially true for inexperienced mothers. The mother can end up killing her litter if she’s really stressed. 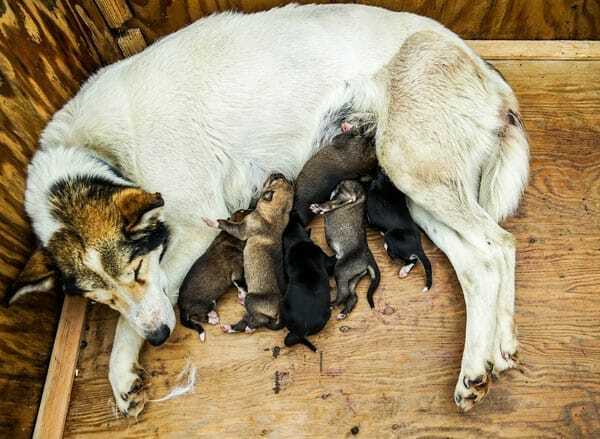 Some dogs do the unthinkable to their own puppies if they feel that they don’t have a quiet, secluded place for their litter to live or if they feel that their litter is too big for them to take care of. And this stress can cause the deaths of the innocent pups. Sometimes you may scream murder without knowing the whole story. Dogs sometimes kill the sick pups that have something wrong with them (which you might not be aware of) so they can focus all their energy on their healthy offspring. You must be thinking this is cruel. But this is nature and I’ll explain why. This is simply a part of the dog’s natural selection at play, which is a part of the dog’s process in the theory of survival of the fittest. The sick puppy may attract predators and cost the mother the entire litter. By mercy killing her own puppy, she might be saving the rest of the litter. Another problem could be that the female dog was bred too young. That’s exactly why no breeding should happen during the mother’s first heat. Or else, she may not be a stable mom ever. In cases like this, the mother must be immediately spayed so that she isn’t allowed to have more puppies again. 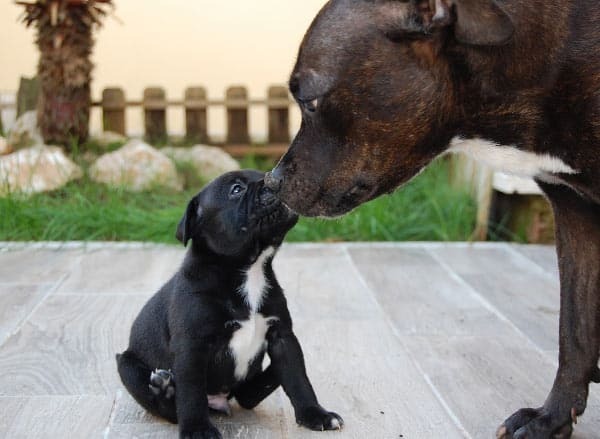 It is natural for the mother to growl or snap at her puppies (the notorious ones that need some discipline!). But it shouldn’t happen in week 1 when the puppies are totally defenseless and depend on their mom for everything. 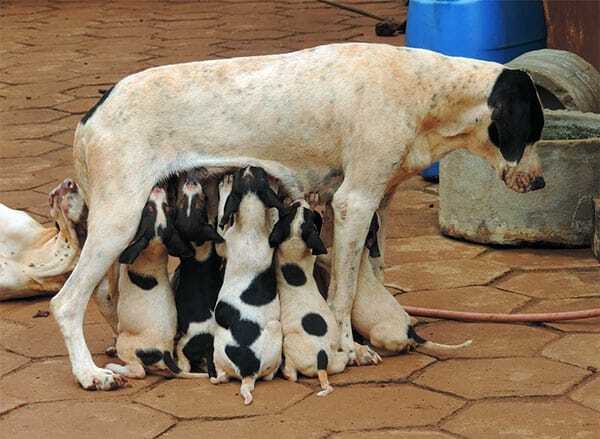 A pup’s main source of nutrition is it’s mother’s milk. Mastitis is an infection that makes nursing for the new mother very painful. In fact, the pain is so bad that the dog can actually reject her entire litter. First off, unless you witnessed the mother killing the puppy, do not assume the worst. There are many other reasons that could have lead to the death of the pups. Puppies spend a great amount of time sleeping during week 1 as they cuddle around with their mother. During this week, the mom should be lively interested in her fur balls. She normally stimulates the little ones to, um, eliminate by licking on their tiny bottoms. And it’s perfectly normal for her to ingest their waste. No cannibalism happening here, folks! ● The ideal temperature must be about 85°F degrees during their first days. It should never be less than about 70°F. Use a heat lamp or heating pad if it’s not around 85°F. ● Some puppies don’t nurse. You need to make sure that all of them must be fed. ● Newborns must sleep close to each other. ● If there’s a puppy that’s acting odd, like, staying away or isolated from others, crying etc. This is a warning sign of something wrong. There are several natural as well as medical issues that may have a hand in the pup’s demise. There’s a thing called Puppy Fading Syndrome which can cause pups to pass away. This can kill them up to the age of 9 weeks old. When you notice anything that raises a red flag, you must take your dog and the pups to the veterinarian immediately! What Can You Do to Prevent the Deaths? 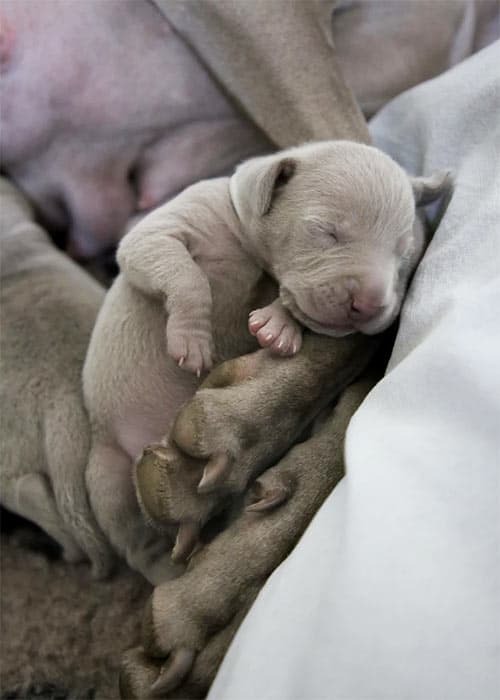 Newborn pups are very vulnerable. In order to keep these fur-balls healthy and safe, you should watch the babies very closely during the critical period, ie, their first few weeks of life and make sure that the pups are acting and nursing normally. You should also observe the mum’s interactions with her litter and look for any abnormal behaviors. Another thing that’ll help would be you sleeping near the litter for a few days so that if you get to hear muffled cries, you’re there to rescue the baby. Also, you should take the mum and the pups to go see a veterinary doctor about 24 hours after the birth so as to make sure that there aren’t any retained placentas. Also, to ensure that the puppies are in good health. Cannibalism in dogs is uncommon, but it doesn’t mean that it won’t happen. The new mother usually eats her own puppy if she doesn’t recognize it as her own as a predatory instinct. Don’t accuse the mom of killing her babies until you’re sure! I hope that I was able to address your question. If you still have a burning query, make sure to leave a comment and I’ll always be happy to reply! My maltipoo just had a single puppy. This isn’t her first litter, more like her 4th. I heard it cry and I checked on her and thought she was cleaning it..until I seen she had punctured its’ neck and heard her crunching Its’ tiny leg. I was mortified and upset. I don’t know exactly how to feel about this or what to do, if anything. Any advice? thank you for giving me answers to my stress and anger on my dog that ate her puppies evry time she has puppies. but what do I do with her? keep her out from the remaining puppies? can you help us. I feel like hanging this dog but who will nurse the puppies. Well, Grace I think you should… like, maybe take all pups [or only one] to the vet. He/she will make sure that the baby[s] are healthy. After the vet, if you see the mother trying to eat one or all of the babies, discipline her. Thanks Marina for agreeing. I appreciate it. My Malinois give birth to 7 pup a week ago. She doesn’t allowed anyone to touch the pup even myself. She step one to death. I had another GSD given birth a week earlier. I m not sure if the pup will survive so I took 5 pup out to the GSD for feeding and left one to the mother. To my horror within minute the mother chewed the remaining pup alive. This is my first experience seeing the mother eating her own pup. I m not sure if it is my mistake of taking the 5 pups out that led to her horror action or thanks god I have save the other 5 pups live.